Dennis is a modern sofa bed with rotating seat. A sofa with a unique design, available in linear and corner models, and with chaise longue. Real feather cushions. 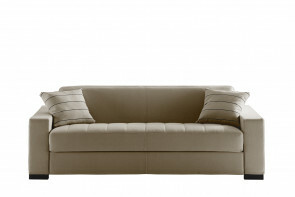 Duke is an Italian convertible sofa with storage chaise longue, also available in corner and linear models. With several armrests and mattresses for every need. 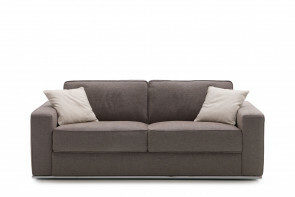 Melvin is a modern sofa bed with side bookcase, available in 2 or 3-seater linear models or in corner ones. With optional tray and ottoman. Slatted base. Shorter by Milano Bedding is a sofa bed with goose down padding. A modular sofa bed also available with storage chaise longue and in corner compositions. 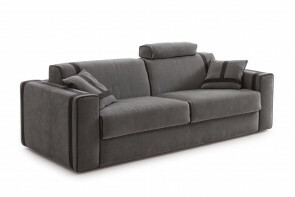 Cooper is a modern 3-seater sofa bed with black leather cover. Also available with chaise longue and with Microfibre cover. Equipped with a cm 200 h.14 mattress. Matrix is a modern king size sleeper bed, also available in smaller dimensions, with chaise longue and in corner models. Seat with a checked one-piece cushion. Prince is an Italian couch bed with metal base, available as a 2 and 3-seater sofa, with chaise longue and corner element. Also with king size mattress. Ellington is an Italian demountable sofa bed with a cm 200 mattress. A coloured two-tone sofa bed covered in leather, eco-leather or fabric. Dave double sofa bed with chaise longue; also available linear. High aluminium feet and padding made of feather and foam mix.